SSCA: Summer School in Applied Classical Architecture at Engelsberg Ironworks. Sudes: A 2-year Master programme in sustainable urban development at the Faculty of Engineering, Lund University (since 2007). Future of Places III 2015: Saskia Sassen lecturing on global property speculation. Urban City Research is a programme that was initiated in 2002. The general theme is The Humane City, and the purpose of the programme is to share knowledge on how to build people-centered cities. Despite ambitious intentions to create a new society for a new era, the modernist urban development that dominated the post-war period focused on technological rather than on human aspects. 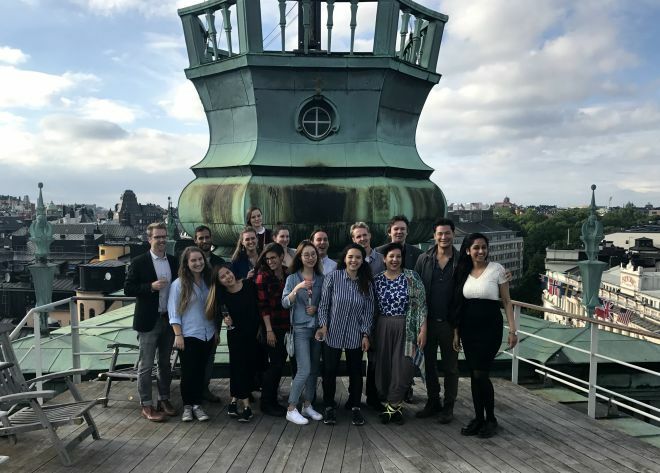 Launched in 2007, AxSud is a centre for sustainable urban design at Lund University, aimed at financing and supporting a two-year Master programme in the field. The Foundation currently supports a two-year Master Programme and a Bachelor Programme in sustainable urban design at the Faculty of Engineering LTH, Lund University, a one-year Master programme in urban studies at the KTH Royal Institute of Technology, and a research centre for urban public spaces (Centre for the Future of Places). To date, 125 students have graduated from the programme.Moreover, a summer school in applied classical architecture (four weeks) is organised jointly with the International Network for Traditional Building, Architecture and Urbanism (INTBAU). In 2002 – 2007, a large number of seminars were held in Stockholm, in addition to three international conferences: New Urbanism – An Introduction to the Art of City Building (2002), Good Mixed-Use for the 21st Century (2004) and Swedish Grace – The Forgotten Modern Movement in Architecture and Town Planning (2005). The Urban City Research Programme finances seminars and conferences throughout the year on various related topics. Since 2013, the Foundation has collaborated with UN-Habitat on The Future of Places, a project to gather researchers and practitioners from the entire world to discuss the importance of urban public spaces. In effect, this was a critique of the exaggerated focus on the buildings and infrastructure of cities, and the lack of attention to the city as a living environment. The Foundation funded three major global conferences and a number of regional ones in 2013, 2014 and 2015, attracting a total of 1,500 participants from 700 organisations, 100 nations, and 250 cities. The high degree of representativity made a huge impact within the UN system, and the principal message of The Future of Places on the value of public spaces significantly influenced the text of The New Urban Agenda and Sustainable Development Goal 11 (Target 11.7 on Public Space). In 2018, the Urban City Research Programme started a collaboration with the Jheronimus Academy of Data Science (JADS) in Den Bosch, The Netherlands, to investigate and develop new research questions on the statistical understanding of a city. The project is entitled: “What is a City in Statistics?” and aims at bringing together statistical bureaux and international organisations to adjust and redefine our common statistical definitions of a city. The Urban City Research Programme started a full project with the Charity Theatrum Mundi based in London, investigating how urbanity constitutes infrastructures for cultural production – and how do these conditions help shaping the cultures of our cities. The project looks at how urban conditions can forge spaces for artists and artisanship in the city, and if these conditions can be consciously designed and planned.